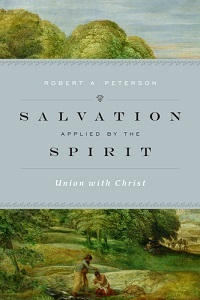 Book Review: “Salvation Applied by the Spirit” by Robert Peterson | J.W. Wartick -"Always Have a Reason"
Robert Peterson’s Salvation Applied by the Spirit is an exhaustive look at the notion that the work of the Holy Spirit is bringing about union with Christ. The first part of the book is comprised of a comprehensive (to my knowledge) survey of texts related to the notion of being “in the Spirit.” Peterson goes across the whole of the biblical witness in order to draw several conclusions, including the notion that being “in Christ” simply is salvation and that this is brought about by union with Christ, which is the work of the Holy Spirit. This first section brings up many intriguing points of inquiry alongside the central theme of union with Christ. Included among these are the meaning and application of the Sacraments (the Lord’s Supper and Baptism), the doctrine of justification and its application, and more. The second part of the book draws broad theological conclusions from the exegetical work done in the first section. Broadly, Peterson uses this to explain the work of the Spirit in santification, justification, and salvation. Other primary theological topics that are necessary for understanding these concepts–such as the Incarnation–are also briefly discussed. The exegetical portion of the book is fantastic and provides not only a solid understanding of the Bible’s understanding of the Spirit’s work in salvation (and particularly that of Paul), but also several insights of the applicability of these discussions to other areas. The discussion of the Sacraments and the Holy Spirit’s work therein, along with the Incarnational perspective, was interesting and somewhat neutral. The notion that the indwelling of Christ may come through a Sacrament like the Lord’s Supper was wonderful to see (from my perspective as a Lutheran), though the somewhat dismissive language of “symbol” applied alongside this discussion gave it a sense of schizophrenia related to the Sacraments. The theological threads of the second part of the book are interesting, as was the choice to spend some time covering topics like the Incarnation while spending lesser time on things like the specific view of justification of the author. The latter synthesis of both a covenantal perspective similar to N.T. Wright’s and the emphasis on imputation of righteousness was intriguing and deserving of deeper exploration. Perhaps the greatest downside to the book is an amorphous sense of audience. It is written at a level which laity will find understandable, but its length will likely be off-putting. Similarly, those looking for a technical discussion will be edified by the quantity of exegetical insights, but perhaps disappointed by the lack of depth. It seems a book a bit caught in the middle between wanting to convey information to the general audience while also appealing to readers with academic interest. Unfortunately, it ultimately doesn’t quite hit its stride with either. Overall, this is a good book looking at an interesting topic. It would just benefit from being either more or less technical. It will benefit greatly readers interested in the work of the Holy Spirit. Robert Peterson, Salvation Applied by the Spirit (Downers Grove, IL: Crossway, 2014). Is ”Lord’s Supper” a Sacrament? Is it necessary for Christians to partake of it? Do you think that Jesus’ command is enough to make something necessary? Luke 22:19 is Jesus explicitly commanding that we continue the practice. Lord’s Supper replaced the Jewish Passover observed by Christ! “Although the Jewish religious festivals are celebrated by Jewish Messianic believers, they are not relevant to Gentile Christians. Paul told us in 1 Corinthians 5:7-8 that Jesus is the Passover Lamb. The Lord’s Supper, therefore, has replaced the Passover. Hebrews 7:27 and other passages declare that man has been once and for all reconciled to God by the death of Christ. Other passages such as Colossians 2:16-17 and Romans 14:5-6 declare that the Old Testament feasts are no longer to be observed: So let no one judge you in food or in drink, or regarding a festival or a new moon or sabbaths, which are a shadow of things to come, but the substance is of Christ (Col. 2:16-17 nkjv).(http://questions.org/attq/should-christians-keep-the-old-testament-feasts/). Well there is some disanalogy between washing feet and the Lord’s Supper. Before diving into that, however, I would say this: you ask “why don’t we wash each other’s feet?” My answer: “Uh…. we do?” Several church traditions do still wash feet at certain points in the year as a kind of reflection on our necessary service to God. So in those traditions, this counter is moot in them. Second, I am fairly wary of just dismissing explicit commands of Jesus by just pointing to something he said and asking “Why don’t we do that! ?” If that’s the counter-argument, I could just as easily say “Why do we still bother to go to all nations and make disciples of them? After all, we don’t wash each other’s feet!” (Or insert other things Jesus says to do like gouging out our eyes to prevent sin, etc.) The argument is unpersuasive because it proves too much. Third, Paul reaffirms Jesus’ command.